"The wonder of Duncan Wells is his assertion of the dignity and ownership of life in the youngster as well as the elder. His ability to still get into the midst of a child is priceless. Although I am sure that Wells will meet with international success soon, and believe me, we will miss him when he does, I feel that he will always be able to grasp the truth wherever he is." Duncan Wells has been working professionally as an independent artist for more than 20 years. He is a musician, songwriter, playwright and actor. As a songwriter his work has been performed by the Cape Breton Summertime Revue, Patricia Conroy, Rita MacNeil and the Rankin Family. As an award winning playwright he is the recipient of the Boardmore Trophy for best original script of 1986 at the University College of Cape Breton's Annual Festival of Plays. His work has also received recognition from the Canada Council for the Arts and Writer's Digest Magazine. Although Duncan has experienced a great deal of success writing and performing for adults he has remained steadfastly dedicated to the creation and performance of original material for children. He is the co-founder of Grey and Pink Productions for Children and founder of The Talent Project for Children. He is the creator of The Full Moon Cafe for Children, the Cape Breton Kid's Club, the Cape Breton Kid's Show and the Clap Your Hands Give a Hoot Hour. 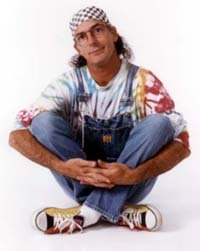 In 1990, he formed Duncan and the Apple in a Tree Band a four piece musical group for children and their parents that continues to receive rave reviews wherever they perform. The band has toured extensively the provinces of Nova Scotia and New Brunswick and was chosen to showcase at the East Coast Music Awards in 1995 and 1996. Duncan has released two full length albums of his original songs for children (Ladder to the Sky-1993 and TLC-1994) along with a storybook and companion tape entitled Duncan Back to Back. His music has received regular airplay on AHHS Radio, the Children's Radio Satellite Network and, in 1996, he was named Children's Artist of the Year by the East Coast Music Association. Duncan Wells continues to reside on Cape Breton Island with his wife Theresa and two daughters, Sarah Jane and Laura Marie. This Canadian Music Webring site is owned by duncan.theresa@ns.sympatico.ca. Want to join the Canadian Music Webring?